Miyukiko (Koko) Kostelny, a SkyWest CRJ first officer, knew she wanted to be a pilot ever since she was a young child. 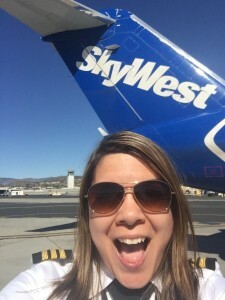 And after attending a Women in Aviation Conference, where she met several SkyWest pilots, she knew that she wanted to fly for SkyWest. How did you decide to become a pilot? Growing up I was surrounded by military aviation, as my father was an A-6 Navigator in the Marine Corps. My family was stationed mostly overseas, so whenever it was vacation time or we were visiting family, we got to fly on many different airlines and aircraft. I still remember as a little girl going up to the flight deck during flights to Guam on a 737, a 747 to Chicago, or a 777 passing through Hawaii. Sometimes we even flew military standby! As a kid, it seemed like a dream job to wake up and fly to/from all of these exotic destinations… all while soaring through the clouds. I couldn’t imagine people got to travel the world as a full-time job! When I took a discovery flight in high school, it was a no brainer. I was hooked, and I knew that this was going to be my career. I knew I was going to enjoy the thrill of flying, and the ever-changing job environment. No day is the same as many things affect our flying, and I knew I would have satisfaction in flying and connecting passengers to the world, just as the pilots had done for me growing up. What made you decide to come to SkyWest? I wanted to be a part of something that was more than just an airline pilot. I wanted to belong to a company where I would truly feel at home; where it was diverse; where I could enjoy flying and have pride in taking our passengers to their destinations. I thought back to when I was an airline passenger and those pilots that showed me the flight deck – I wanted to have pride in my job, company and career. Pilots connected me to the world and I wanted to do the same. I’ve been fortunate enough to have mentors at SkyWest and they have spoken so highly of the company over the years that I wanted to be a part of it. When I first met SkyWest pilots, I was a freshman in college attending the Women in Aviation Conference. I was a shy student pilot and went to look at the exhibit booths. It was after the market had crashed, so the conference mood wasn’t the happiest. However, the SkyWest booth was something different. Everyone was still smiling there. I made my way over to the booth so I could talk to them. I mentioned that, “I’m far from the airlines because just a student pilot, I’m waiting to take my private practical.” I was corrected by a female captain as she told me to have pride in every step of my career. A male pilot working the booth said the same thing. Before I knew it, the pilots were sharing their flight training experiences with me and we talked for a long time. I walked away from the booth with a nice SkyWest CRJ200 model (which is on my bookshelf to this day! ), business cards, and a great impression of what could be a future employer. I still remain in contact with those pilots, and I went back to the SkyWest booth every year after that… and now I’m working for SkyWest. I returned to that booth every year because I enjoyed seeing the friends and mentors I met my first year, and because I enjoyed meeting new SkyWest pilots every year. As the years progressed, I knew I wanted to be at SkyWest. The company attracted me so much because of the great personalities of their employees. When flying on SkyWest flights in college, I saw pilots and flight attendants go out of their way to make the passengers’ flight more enjoyable. Seeing the pilots jump out of the flight deck to help the elderly even on a quick turn tells me that they aren’t here just to fly the plane. That’s the kind of co-workers I want to be surrounded with, and I’m so lucky to have that now. What do people say when you tell them you’re a pilot? Usually people are impressed! I get asked how young I am, or how I became a pilot. Sometimes people ask me if I’m really a pilot (even in my uniform!) or “Can girls really be pilots?” and that saddens me because that shows that some people out there still don’t have a good concept of female pilots, but it’s a rare occasion… that stigma is changing with the increasing number of female pilots! On my last trip, I had an older Spanish-speaking man who needed help finding his gate. After I helped him look at the gate information, he paused to look at me up and down. He asked me what I did, so I told him that I was a pilot. He was so ecstatic to meet a female pilot that he proceeded to hug me and kiss me on the cheek! It took me by surprise, but he told me to always keep my chin high. He was a military pilot in his country, and he never worked with female pilots but thought it was so neat to meet one. What advice would you give to women who are considering becoming pilots? Get out to your nearest airport and take a discovery flight! The next time you fly on an airline, ask the pilots to see the flight deck! You never know what might spark your interest. Have curiosity, and ask the pilots questions. If you want to be a pilot, don’t be shy about it. I’ve done many Girl Scout Aviation Merit Badge seminars with The Ninety-Nines, and so many girls are shy about liking airplanes, math or science. I think it’s wonderful to be engaged in those subjects. Know that flying is for boys and girls! Just this past weekend, I had my first all-female crew. I was excited because it had only been a month of flying with SkyWest. On one of the turns, we had a mother and her daughter visit the flight deck. Although that family flew a lot, they had never seen a female pilot… let alone an all-female crew! The little girl walked up to the flight deck, pushed by her mother. She was shy, but said hi. After asking us what some of the buttons and switches did, she asked, “Why are you the first girl pilots I met?” I didn’t know what to say… but then after getting plastic wings she whispered, “I want to be a pilot too, so I can look pretty and see the clouds every day.” My heart was instantly warmed and I saw myself in that girl. There are many resources now that can help with females in their journey of becoming a pilot. I am a member of Women in Aviation and The Ninety-Nines, both great organizations that have helped me become who I am. These two organizations are wonderful ways to get involved in aviation not only for friendship, but for mentoring, scholarships, memories and more. Through these organizations I’ve made great friends that each advanced in their own field of aviation. I’ve been fortunate to receive scholarships for flight training as well. There are opportunities for all levels, from student pilots to type ratings! These organizations also have top notch mentoring programs built into them. I was a part of them as a college student, and now I’m the one giving advice to younger girls! Sometimes I find it hard to believe, but then I know that I made it where I am today because of others that helped me. SkyWest supports Women in Aviation and will be attending the 2016 Conference March 10-12. The pilot recruiting team will also be holding on-site interviews for those who are ready to take their career to new heights. Learn more about flying at SkyWest and apply today by visiting www.skywest.com. 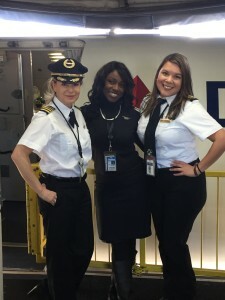 Check out this blog post featuring SkyWest Captains, Mary Conti, Suzy Garrett, and Jen Johnson. 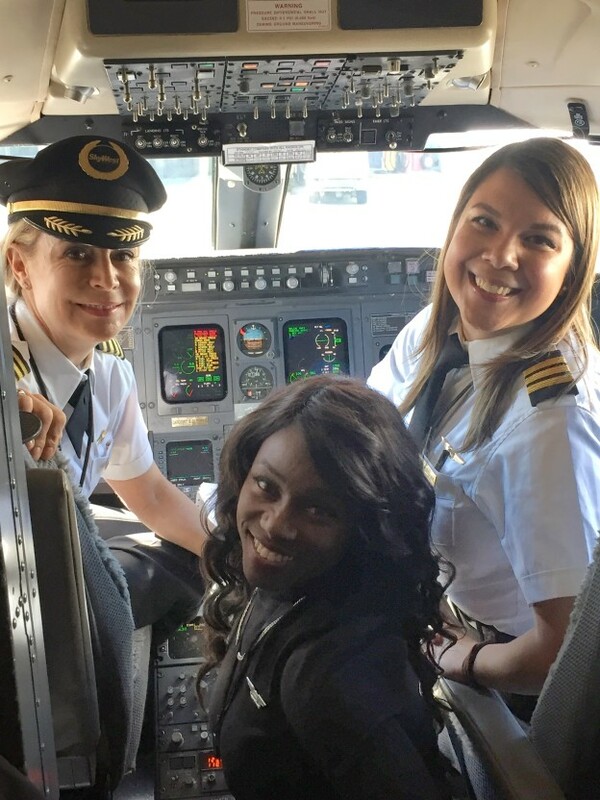 Not only have they realized their dream of flying, but they continue to set an example for other young women and girls to follow.